Die-Pat F51 Range of stainless steel baffle grease filters are designed to offer optimal performance. 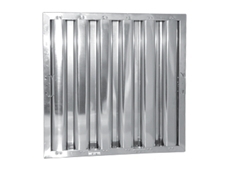 The unique rounded baffle design maximises grease impingement and facilitates cleaning. 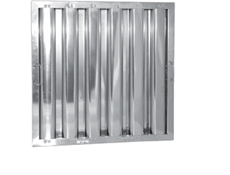 Specifically designed for commercial cooking hoods. Stainless steel construction for durability, corrosion resistance with self-balancing air flow throughout the entire length of the hood. Smooth surfaces permit constant grease run-off into hood collection trough. Bright stainless finish is aesthetically pleasing, ideal for front of house installations. F51 baffle grease filters comply with the DW172 standard.